It has to be for this club, in desperate need of change, re-direction and financial investment. The 2010-2011 season has to be the dawn of a new era as the club face up to the realistic possibility of no Champions League football for the coming season. So if the change of ownership happens and new investors are found to move the club forward as well as wanting to challenge with the elite teams in England and European football, what else needs to change at Liverpool. I personally believe the club needs two key changes to allow them to move forward, two changes one of which many Liverpool fans seem divided on and another Liverpool fans seem dead set against. 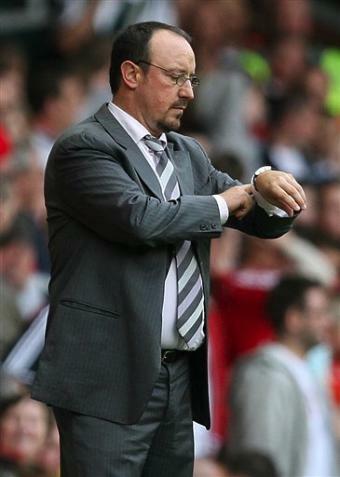 Rafael Benitez (pictured below) has to leave or be sacked. As simple as that. He has become a very stubborn manager in this past season and to the detriment of the Anfield club. To publically guarantee fourth place and fail to deliver would be a sack-able offence in many lines of work. He has delivered a threadbare squad, thin on numbers, thin on quality and thin on players worthy of the fans who adore them. His public outbursts have left him as cannon fodder for football media and opposing fans alike whilst his own squad appear bemused at his methods, with several current or former players stating so, Albert Reira be my case to the defence here. His transfer dealings (including Robbie Keane, pictured below) have shown many a weakness, both in-coming and out-goings have shown worrying signs for a manager at the top-level of the game, back this up with an alleged scouting network of approximately 70 scouts and it makes you wonder who he listens to. He has shown tactical failings in two of his trusted systems. The insistence of zonal marking whilst defending set-pieces has failed the team on several occasions over recent seasons. It appears the system is something of a problem for the Liverpool defensive unit whilst on the field of play. It is obviously not carried out to its required details and leaves them looking confused and lost on many an occasion. Coupled with his insistence on playing 4-2-3-1 at every opportunity shows a manager who has run out of ideas, doesn’t have players to effectively play two central forwards and one who has purchased players who do not suit this system. Finally, I feel the club need a change on manager just to freshen things up and give a new wave of optimism at the club, something the fans need. It is obvious to all outside of Merseyside, that Liverpool and Everton both require new stadia to aid with both clubs ambitions to compete at the highest level of the game, but with this it appears neither club can afford to do so. You know what I am going to say don’t you? Yes, that’s it, ground share, both clubs and their prospective fans need to swallow their rivalries and make this venture happen. It will benefit the city, the people who reside there, both clubs, their fans and English football too. The possibility of another 60,000 plus all-seater stadia in England is a definite need for any future World Cup bid. Both clubs sell-out 99% of the time and they would easily be able to fill a stadium of this size, it is just a shame pride seems to be getting in the way. Look at some of the examples in Europe, where both teams share a stadium despite ferocious rivalries. Inter Milan and A.C. Milan share a stadium as do Roma and Lazio, as do Genoa and Sampdoria. 1860 Munich and Bayern Munich share the delightful Allianz Arena (pictured below) in Germany, a stadium whose external colour changes depending on which team is the home side on match days. Revenues will increase, ownership could reside with local authorities and this will truly benefit both clubs, who are failing to compete with the spending powers of Manchester City or even the likes of Aston Villa or Birmingham City. These changes coupled with new ownership of the club will help to move the club in the right direction and hopefully be able to challenge regularly for the 19th league title the clubs fans so desperately desire. What do you think Liverpool fans? Change is needed and now seems the ideal time to make wholesale changes, once and for all. Let me know your thoughts and opinions. P.s. Check out Rafa’s signing since he took over at Liverpool and those he sold. I think you’re spot on with this assessment of Liverpool, and Rafa Benitez. I, personally, find your thoughts on ground share very interesting, and I completely agree with you. You can’t defend building two spanking new stadiums with a capacity of 55,000+, it’s just not viable. Keep up your good work, I really enjoy reading your blog. I appreciate your comments and Liverpool would benefit so much from a 60,000 plus all-seater stadium, but will it happen? ?